I've been hearing the positive accolades for VOX Table since it opened last year. 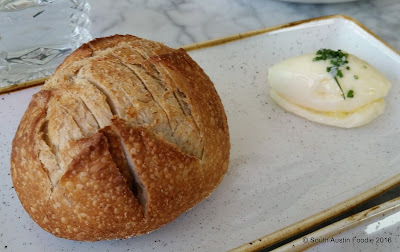 I was finally able to go for a recent Sunday brunch, which turned out to be a bread-lovers dream come true! 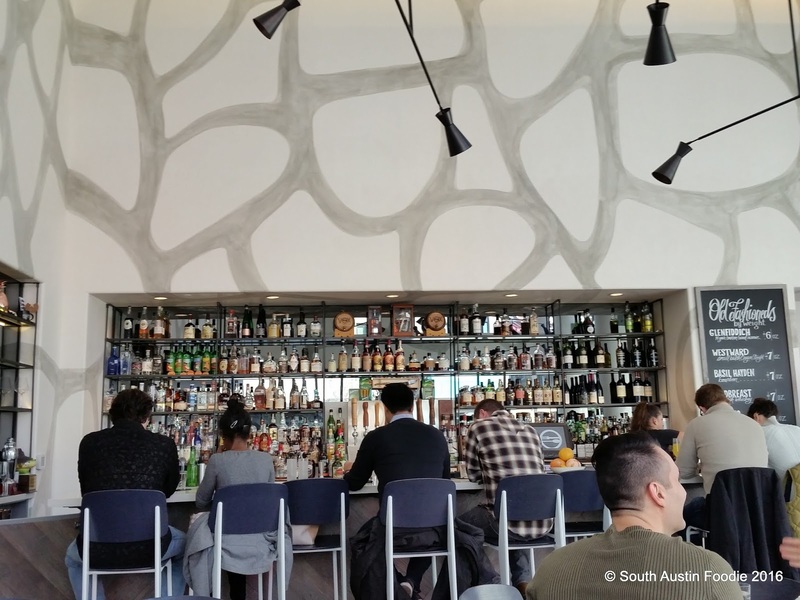 Located in the new Lamar Union complex, VOX Table sits just across from the entrance to the Highball and the Alamo Drafthouse. There's free parking in the garage, and free valet parking in the evenings. The restaurant's interior is light-filled, thanks to big windows, and the decor is a very uniform monochromatic gray and white. While that can come across as boring, here it is not; a huge painted wall above the bar keeps it interesting and tied together (not sure if this is considered a mural or just free-form design but it also mirrors the white and gray marble tabletops). Even the restroom and two private dining areas (one open alcove for maybe eight people, and a larger room that could be closed off entirely) are devoid of bright color, but all the neutral decor lends to making the food *pop* even more. 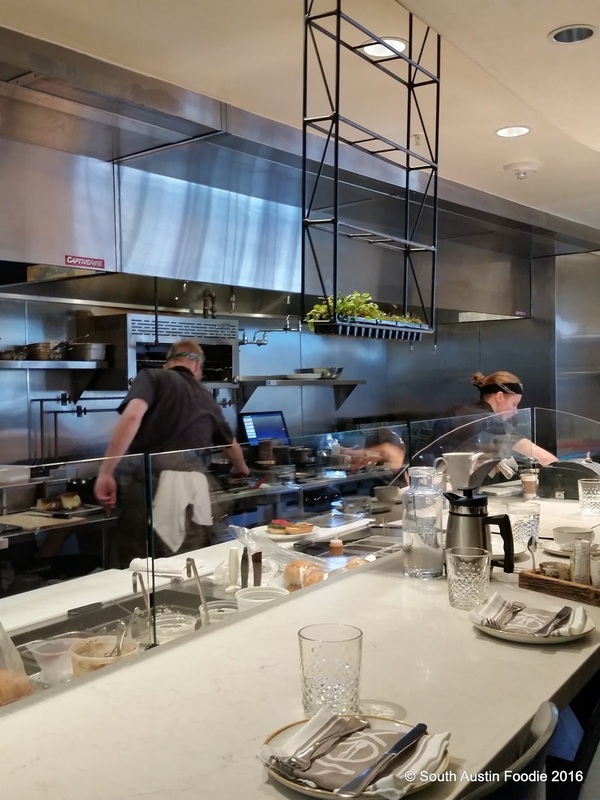 There are seats at the bar, and also a few at the counter overlooking the open kitchen; it would be fun to sit here and watch the action! 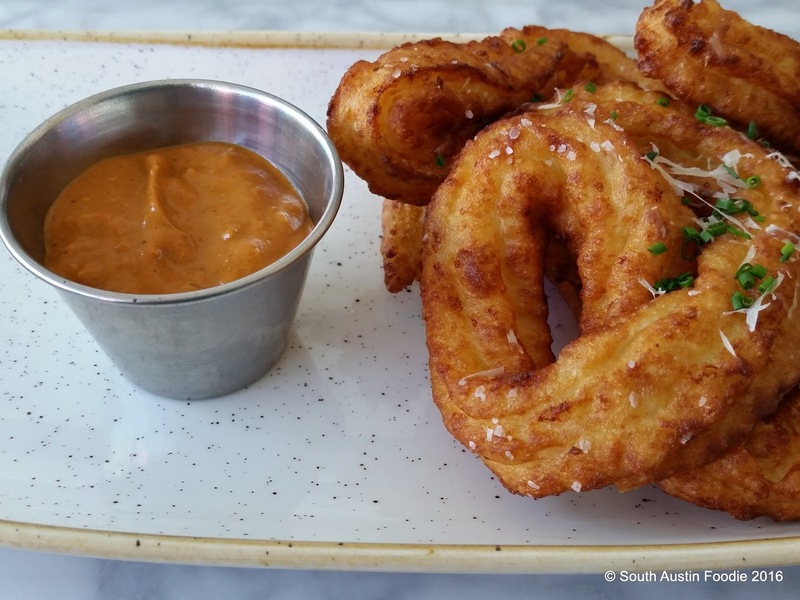 My friend and I started with the potato churro appetizer, which comes with "VOX Sauce" that turned out to be a nice smoked paprika aioli. The churros were nicely crisp and squishy (the technical term!) at the same time. I can think of a ton of different uses for that sauce! The appetizer section of the menu features a "bread of the day" with cultured butter. I am never one to refuse good bread, so when my friend suggested getting it, I was thrilled. This was some sort of whole wheat bread, and possibly sourdough... can't remember, but it was delicious! My friend ordered the French toast, which isn't your ordinary French toast. 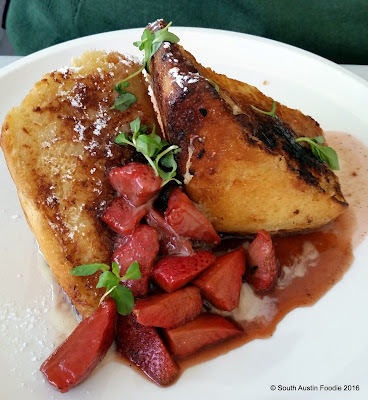 Ricotta stuffed brioche bread with roasted strawberries and a balsamic drizzle. All it needs is some bacon. Oh my! 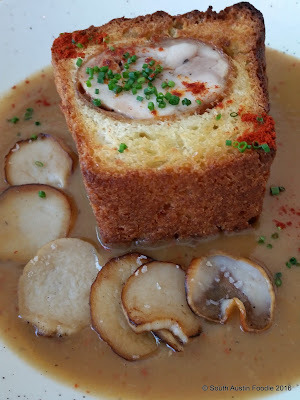 I opted for their version of "biscuits and gravy" which had a chicken roulade baked inside this delicious bread, with mushrooms and chicken gravy. I loved every aspect of this dish except the chicken. And the chicken wasn't bad, but I think I wanted it to be more like fried chicken and it wasn't. Texturally it just seemed a bit soft, but not undercooked. But the bread with the silky smooth gravy was divine. Unfortunately, we did overload on bread, so we didn't leave room for dessert. Which means a return trip is in order! We had a reservation for 11 am, right when they opened, and by the time we left, the place was packed, so I would certainly recommend making one. I would love to go for dinner, and see how different the vibe and lighting is, as we were blessed with a bright sunny day. 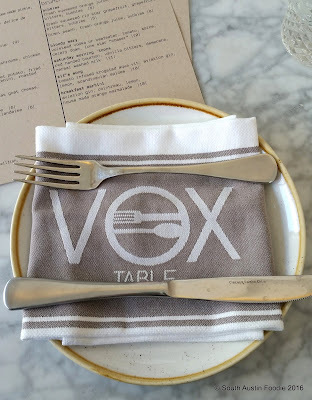 VOX has the feel of both a causal and fine dining establishment; there were families with kids, but it was mostly adults of different ages and different styles of dress. 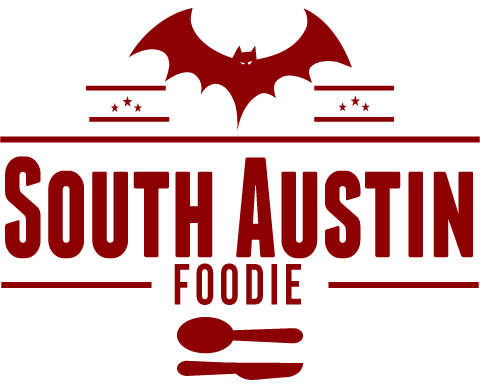 As in very Austin. Good service and delicious food, and whoever is in charge of their different breads is amazing! Dinner and a movie anyone? Ah I wish money grew on trees and I can just spend my time eating and traveling. 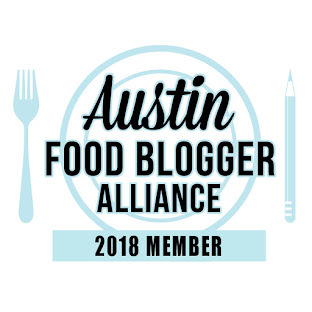 This has been on my Austin bucket list!